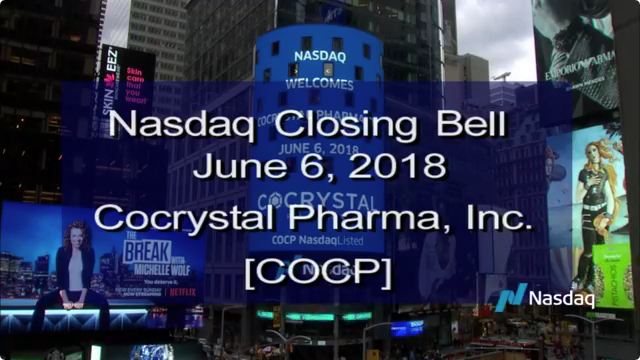 BOTHELL, WA, Jan. 22, 2019 (GLOBE NEWSWIRE) -- Cocrystal Pharma, Inc. (NASDAQ: COCP), (“Cocrystal” or the “Company”), a clinical stage biotechnology company discovering and developing novel antiviral therapeutics, today announced safety and preliminary efficacy data for its U.S. Phase 2a study evaluating CC-31244 for the ultra-short treatment of HCV infected individuals. CC-31244 is an investigational, oral, potent, broad-spectrum replication inhibitor called a non-nucleoside inhibitor (NNI). Epclusa (sofosbuvir/velpatasvir) is an approved 12-week therapy for HCV developed by Gilead Sciences, Inc. The U.S. Phase 2a study is an open-label study designed to evaluate the safety, tolerability, and preliminary efficacy of CC-31244 with Epclusa in 12 subjects with treatment-naïve HCV genotype 1. Subjects received oral 400 mg of CC-31244 and Epclusa for 2 weeks. Following this, the subjects continued Epclusa treatment alone for another 4 weeks. All subjects completed the 6-week treatment regimen. The treatment was well tolerated with no study discontinuations due to adverse events. Eight of 12 subjects achieved the primary efficacy endpoint of sustained virologic response at 12 weeks after completion of treatment (SVR12). SVR12 is defined as undetectable virus in blood 12 weeks after completion of treatment and considered a virologic cure. “There is currently no approved HCV therapy of 6 weeks duration or less. We are encouraged by our preliminary safety and efficacy data with CC-31244 and Epclusa showing no drug-drug interactions and substantial efficacy. The data obtained from this trial used 2 weeks of CC-31244 in combination with Epclusa. Our future trials may look to extend the duration of CC-31244 up to 6 weeks as part of a combination therapy to evaluate whether such a regimen will result in higher cure rates. We are also pleased that the planned investigator-sponsored trial is moving forward in Hong Kong to continue to evaluate CC-31244 in different combination therapies,” commented Dr. Gary Wilcox, Vice Chairman and Chief Executive Officer of Cocrystal. Plans are underway to commence the second study in the HCV clinical development program, a Phase 2a study in Hong Kong evaluating the safety, tolerability and preliminary efficacy of CC-31244 in combination with sofosbuvir and daclatsavir with or without a protease inhibitor, for the treatment of hepatitis C. The Humanity & Health Research Centre expects to commence the study in Q1 2019. The upcoming, Hong Kong Phase 2a open-label trial differs from the current Phase 2a trial Cocrystal is conducting by use of a protease inhibitor as part of the combination regimen and a shorter treatment duration. Sofosbuvir/Velpatasvir for the treatment of Hepatitis C". World Health Organization. Retrieved 29 June 2017. Sofosbuvir and Velpatasvir. The American Society of Health-System Pharmacists. Retrieved 8 December 2017. Cocrystal Pharma, Inc. is a clinical stage biotechnology company discovering and developing novel antiviral therapeutics that target the replication machinery of hepatitis viruses, influenza viruses, and noroviruses. Cocrystal employs unique structure-based technologies and Nobel Prize winning expertise to create first- and best-in-class antiviral drugs. CC-31244 is in a Phase 2a trial as part of a cocktail for ultra-short therapy of 6 weeks. It is a broad-spectrum novel non-nucleoside replication inhibitor of the hepatitis C virus. The Company’s lead candidate for influenza is effective in animal models against both the pandemic and seasonal strains of influenza. In a separate program, novel inhibitors effective against influenza strains A and B have been identified and are in the preclinical stage as part of a worldwide exclusive license and collaboration agreement with Merck. In addition, the Company has a pipeline of promising early preclinical programs. For further information about Cocrystal, please visit www.cocrystalpharma.com. This press release contains forward-looking statements within the meaning of the Private Securities Litigation Reform Act of 1995, including our anticipated plans for future trials and expectations regarding the timing for the initiation and future progress of the Hong Kong Phase 2a study. The words "believe," "may," "estimate," "continue," "anticipate," "intend," "should," "plan," "could," "target," "potential," "is likely," "will," "expect" and similar expressions, as they relate to us, are intended to identify forward-looking statements. We have based these forward-looking statements largely on our current expectations and projections about future events. Some or all of the events anticipated by these forward-looking statements may not occur. Important factors that could cause actual results to differ from those in the forward-looking statements include the availability of products manufactured by third parties, receipt of regulatory approvals and the ability of the Hong Kong clinical research organization to recruit subjects. Further information on our risk factors is contained in our filings with the SEC, including our Quarterly Report on Form 10-Q for the quarter ended June 30, 2018, the Prospectus Supplements dated July 19, 2018 and April 30, 2018, and our Annual Report on Form 10-K for the year ended December 31, 2017. Any forward-looking statement made by us herein speaks only as of the date on which it is made. Factors or events that could cause our actual results to differ may emerge from time to time, and it is not possible for us to predict all of them. We undertake no obligation to publicly update any forward-looking statement, whether as a result of new information, future developments or otherwise, except as may be required by law.